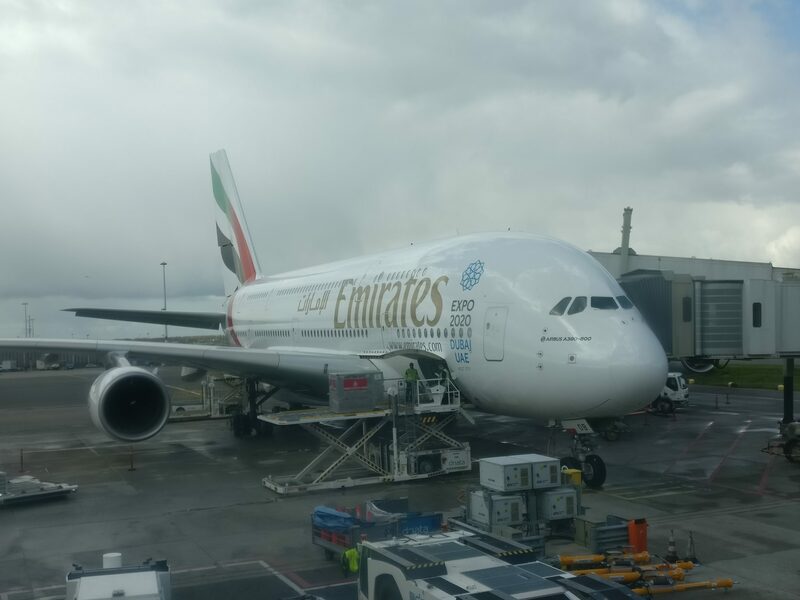 On my recent visit to Dubai on Emirates Airline, I was pleased to discover that I’d be flying on a plane I’d only seen from a distance before: the enormous Airbus A380. The A380 is a behemoth of a plane. Like Boeing’s 747, it just doesn’t look like it should be able to get off the ground at all. It’s even bigger than the 747, and contains two decks that both run the length of the plane. how incredibly luxurious the business and first class cabins are on Emirates and other airlines. Apparently, while business class has lie-flat seats, first class has separate little rooms for each passenger, as well as a bathroom with a shower! I, however, didn’t get anywhere near business or first class, both of which were upstairs while we mere mortals were downstairs. We even entered the plane through different jet bridges, so the upper classes wouldn’t have to rub shoulders with the hoi polloi. 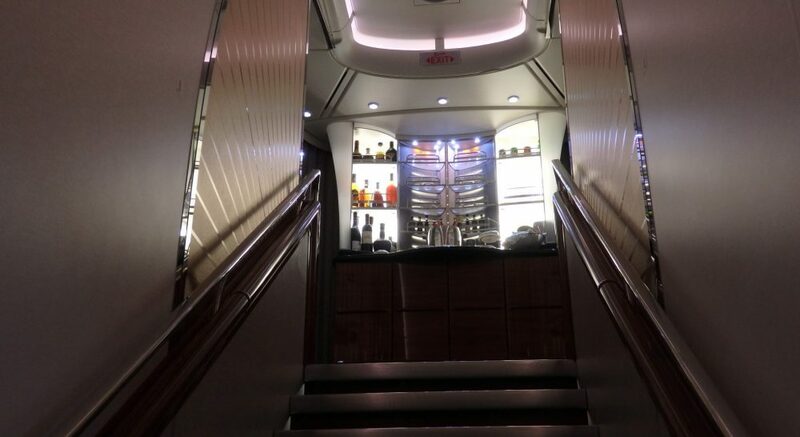 This is the closest I could get to the business and first class cabin upstairs on the Emirates A380. My pleas to let me, as a travel blogger, take a few pictures upstairs (“Five minutes, tops!”), were denied since I should have arranged it ahead of time, so I can’t attest to how fancy it must be in business or first class. 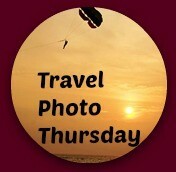 If you’re curious, click here to see Emirates’ own photos. I’ll wait. Update April 2018: Since I wrote this, I’ve traveled the same route twice more, and still haven’t seen upstairs. Both times I wrote for permission ahead of time, but it was denied. The reason given was that they needed a short turn-around time. I’m skeptical. 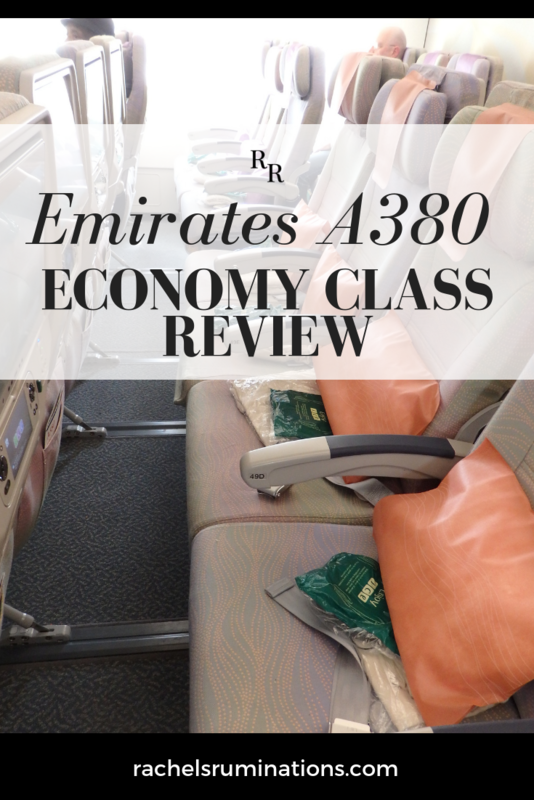 What I can do is review Emirates’ A380 economy class. According to a very friendly flight attendant I consulted, the flight I flew had 427 economy seats, 76 business seats and 14 first class “suites” (another indication of the luxury of business and first classes: 90 people on only somewhat less floor space than 427). The configuration of the economy seats was three-four-three in most rows. 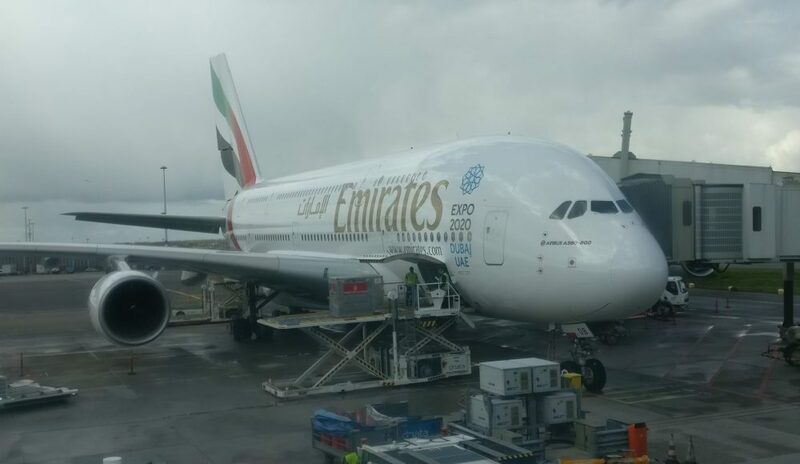 Overall, I was very pleasantly surprised at Emirates A380 economy class. The seat pitch, for example, was adequate; my knees didn’t press up against the seat in front of me. I could cross my legs, and when I wanted to stretch my legs out straight, I was able to do so under the seat in front of me. On many airlines that isn’t possible since my knees would hit the seat back if I tried. And speaking of room, the overhead compartments had ample space for our carry-on bags, for a change. Update April 2018: I flew twice to Dubai in the last month. I took KLM on the first round-trip, and it compared negatively to the second round-trip, which was, again, this Emirates A380. In the KLM economy class, I had similar leg room, but the seat was an inch or so narrower. I could feel the difference. This gives an idea of the seat pitch on the Emirates A380. Hundreds of movies and TV shows, as well as music and games, are available on demand on the seat-back screens, and I appreciated that we could start a film even before we took off, though announcements from the pilots or flight attendants would pause the film from time to time. Headphones were provided as well. This was also true on the KLM flights. Besides the options on the screen, the whole plane had WiFi, and it was free. I was able to have a conversation with a friend on Facebook messenger with no problem at all. On my flight in April 2018, there was again WiFi, but it was very slow, and I quickly gave up on it. 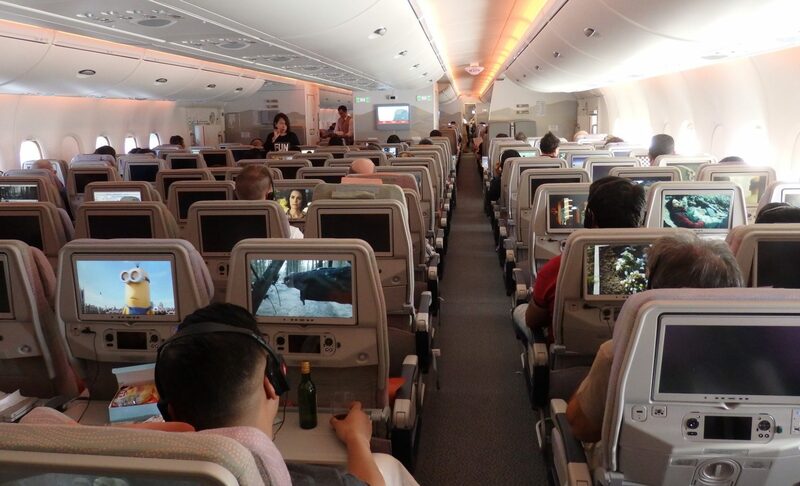 a view down the length of the Emirates A380 economy class. You can see the seat-back screens here too. The seat back also had a very welcome usb charger port, and even a plug for a regular electrical cord. Unfortunately the format is British-style, which is what is used in Dubai, and only 110 watts. Before we even took off, the flight attendants provided us with a hot washcloth, and we were offered another toward the end of the flight. Soon after the washcloth, a flight attendant handed each of us a menu, listing what our meal choices were. The menu got my hopes up a bit, but the food was pretty typical airline food: edible but not particularly flavorful. I appreciated having metal utensils, rather than the usual plastic, and a small boxed snack that I could save for later. April 2018: The service was similar on KLM, but without the extras like the hot washcloths or offering water or juice now and then throughout the flight, like Emirates did. 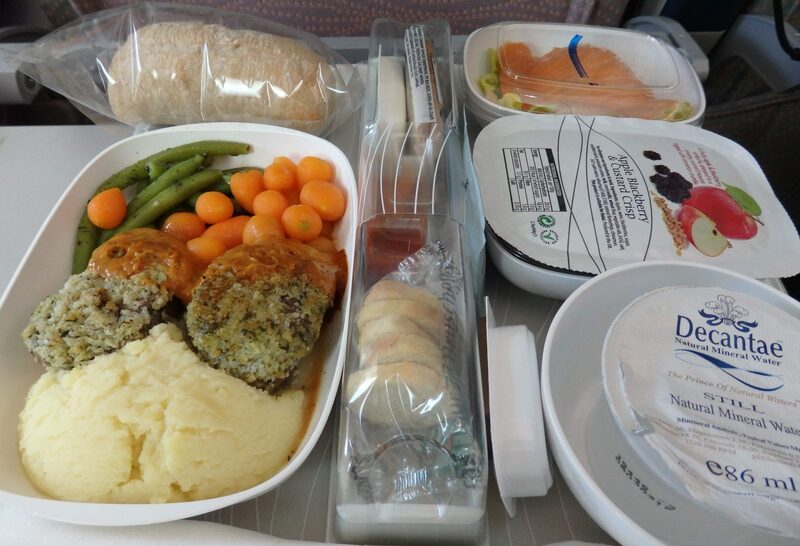 The food on KLM was similarly plain. My dinner on an Emirates A380 flight. The box in the center contains snacks for later. If you’ve been reading this blog for a while, you’ll know that I battle with fear of flying. When I’m on a Boeing 747, it always feels and sounds like a struggle to get such a tub of an airplane off the ground. The engines roar, and it takes a long period of acceleration before it finally, ponderously, lifts off the ground. The A380 is different. It’s quiet, for one thing. Not perfectly quiet, of course; the usual background hum was still there, but it didn’t grab my attention the way it usually does. The takeoff seemed easy and was incredibly smooth; I could barely even tell we’d left the ground. One channel, called “airshow,” lets you view the flight through cameras on the exterior of the plane: looking down, looking up, or this one, looking forward from the tail. Both of my recent flights were extremely smooth. On the first one, on my way to Dubai, we passed through a period of minor turbulence and the pilot turned on the seatbelt sign. Nevertheless, I didn’t feel the sort of adrenaline-fueled panic that is my norm. It’s hard to explain, but it’s as if, rather than being shaken around by the turbulence, the plane just cut through it. The plane still shook, but much less and also less violently than I’ve experienced in other planes. It felt as if it had been cushioned, or a bit like how a boat deals with small swells on a lake. I don’t know for sure, but I suspect that my lack of adrenaline spikes didn’t really have to do with the turbulence but, rather, with the quiet. Normally, you hear all sorts of sounds during the flight, or at least you do if you’re a fearful flyer. The plane bumps and hums and whines. None of that would bother me if the sounds stayed constant, but, on most planes, they don’t. 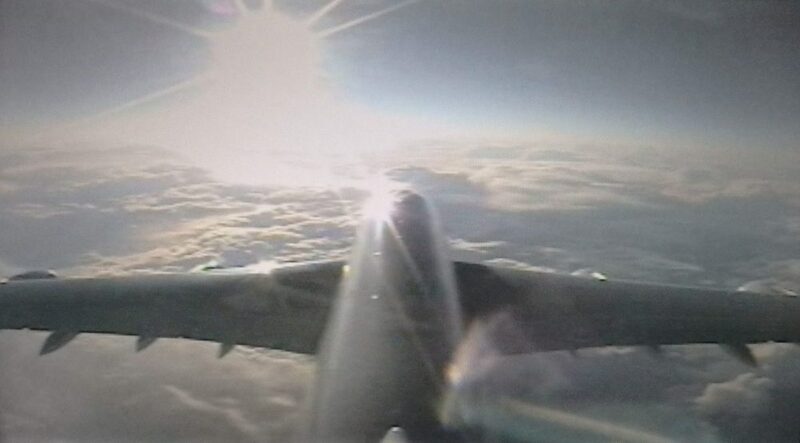 When the plane hits turbulence, the pilot might get permission to change altitude or go around a patch of clouds. Every adjustment to the wings and every acceleration or deceleration of the engine is audible to anyone suffering from a flying phobia. Not on these flights, though: I did not detect a single external noise, except a grinding sound when the landing gear was raised and lowered. What a difference that makes! Update April 2018: This was the biggest difference between the KLM flights and the Emirates flights: KLM flies the route in a shiny new 777-200. It has all the bells and whistles that the A380 has, like fancy lighting that’s supposed to help you adjust to the new time zone. However, it doesn’t smooth out the turbulence as well as the A380. I could hear engine noise changes that I didn’t want to hear. I chose to fly Emirates based on convenience and timing, not in order to experience Emirates or because of this particular plane. As a matter of fact, I was looking for a flight where I could get air miles, so I would have preferred KLM or one of its partners. Nevertheless, these two flights were thoroughly successful for me, which, believe me, is an achievement. At the same time, I’d be curious to try Emirates economy class again but on a different plane. I’d want to see if, for example, the seat pitch is just as good, or if it’s more like most other airlines. Or, alternatively, to fly on an A380 again, but operated by another airline. In other words, I can’t tell if my positive experience is because of Emirates or because of the A380. If I try one or the other alternative in future, I’ll let you know. Update April 2018: Judging from my two experiences traveling to Dubai recently on KLM and then on Emirates, I’d say it’s at least in part because of the A380. 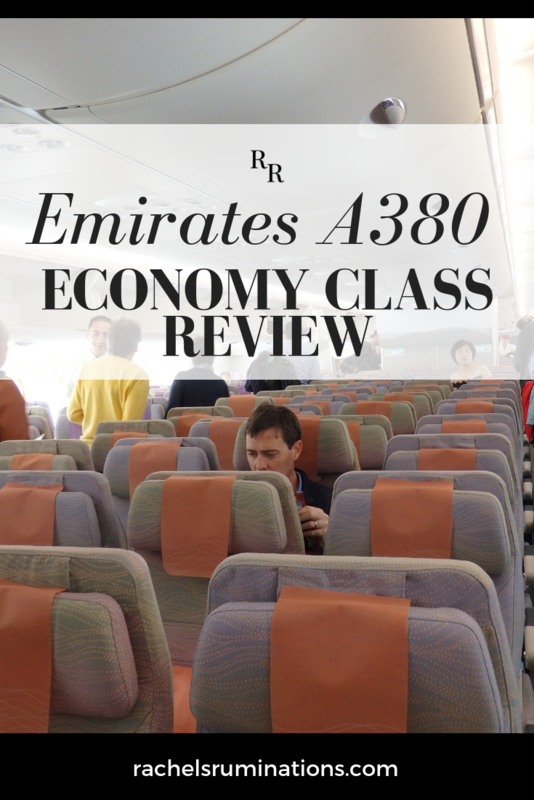 If you liked this Emirates A380 economy class review, please share it on social media. The pictures below are perfect for pinning! I’ve been on a A380 on BA. The separate entrance for upstairs is pretty practical or you’d have to haul your hand luggage upstairs. I didn’t think it was much different from business on BA on a non-380 other than that the bathrooms were bigger. That makes sense. Though I’m curious about how the economy class compares to Emirates. I flew a few years ago on BA 747 to the US and was distinctly underwhelmed. The furnishings were positively antique! Also that ‘airshow’ view looks pretty cool. Do they turn it off for your landings? Yes, I saw that about bland airline food. I wonder if they manage to counteract that effect in first or business class!  No, they don’t turn off the “airshow” for landings. That was when it was most interesting. The rest of the flight it’s pretty boring: just solid clouds and sky. This looks nice, but I’m partial to the Boeing 787. I would argue that the 787 is even quieter AND can fly to more locations than the behemoth that is the A380. The air circulation system and lighting were designed to make you less tired – and it’s actually the quietest airplane in the sky. Really? I don’t think I’ve ever flown on that one. I find my flying experience has a lot to do with the crew. We flew Emirates to and from Australia and Rome last year on one of the A380 (economy class) and had two totally different experiences. It must have been where we sat on the way over (toward the rear of the plane) as it seemed to sway or shake it’s tail a bit, but not so on the way back. The staff were not very pleasant on the way over to Rome and twice we could not get our choice of meal because they has run out by the time they got to us. None of these occurred on the return journey and it was much better. I thought the room for stretching out was good and had my legs extended under the seat in front a lot of the time. I’ve never had a complaint with any airline’s food and find them all similar. I’d say the thing that defines my opinion of aircraft is the crew. I always buy a bag of some sort of sweet in the airport and hand it to a flight attendant to share with the other flight attendants. They’re always surprised and pleased and it puts them in a good mood for everyone. They get pretty badly treated by so many people that a bit of kindness surprises them! As whenever possible I select my seat ahead of time somewhere near the wing, where the turbulence is least. Rachel, I am scared of flying too. The worst part is that the anxiety starts about 3 days before taking the flight. It is hard to eat and sometimes, I feel a bit sick. So, it is nice when you get on a comfy plane with nice features. I have heard of Emirates excellent service and it an airplane I would like to try. I have taken some Asian airlines and they are great. Another frequent traveler who’s afraid of flying! In the days leading up to a trip I try to keep busy so I’m not thinking about it too much. Otherwise I need a few days after the flight to recover! Just a suggestion: you can get a script for one or two Valium & take one when you arrive at the airport. It doesn’t make you loopy or anything, it just takes the edge off of the apprehension for you. I’ve done that too, and it helps. Tamazapam works well too and doesn’t last as long. Me too! I know the science behind it, but I can’t quite believe it! I flew a A380 from Beijing to Dubai last summer. Must admit I didn’t really notice much of a difference once inside the plane. Could be because it was way past midnight, and I was possibly way past being very observant. I do like Emirates, though, one of my fave airlines. To a fearful person who’s attuned to every sound, this plane is definitely different! Sounds like this economy flight was a bit better than a typical economy flight. Can’t remember the last time a hot cloth was given to me at take-off. Too bad they didn’t let you up to first class. Very interesting point you made that there are 90 vs. 427 people in the same amount of space. Wow! That’s where they make the big money! It’s either a sign of age or too much travel that I don’t remember which airline I flew with on my one and only A380 experience. All I can say is that I had looked forward to it for a while, and that I loved every minute while I was on it. 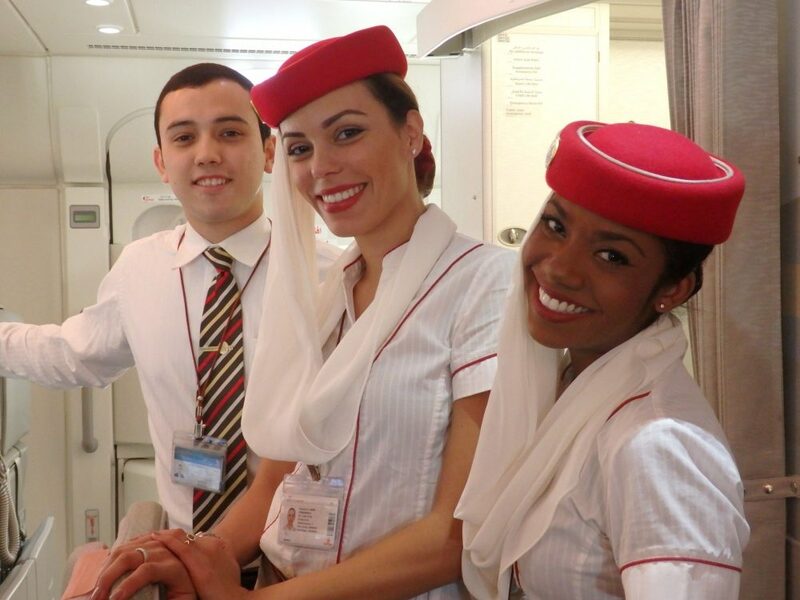 I also love Emirates – I live in Europe and Emirates is my airline of choice when I travel to the Middle East or beyond. And now you’ve made me want to run to the airport! Well, I wouldn’t go that far! I’m still afraid of flying, but these flights were remarkably fear-free for me! Haven’t flown on an A380 of any airline yet, but always heard Emirates is one of the best. Would love to just for the sheer size of the plane sometime… oh, and we could dream about being upstairs. No apology necessary! I’m pretty inconsistent about it too! RE.” I can’t tell if my positive experience is primarily because of the airline or because of the A380.” From what I hear and know it is both. 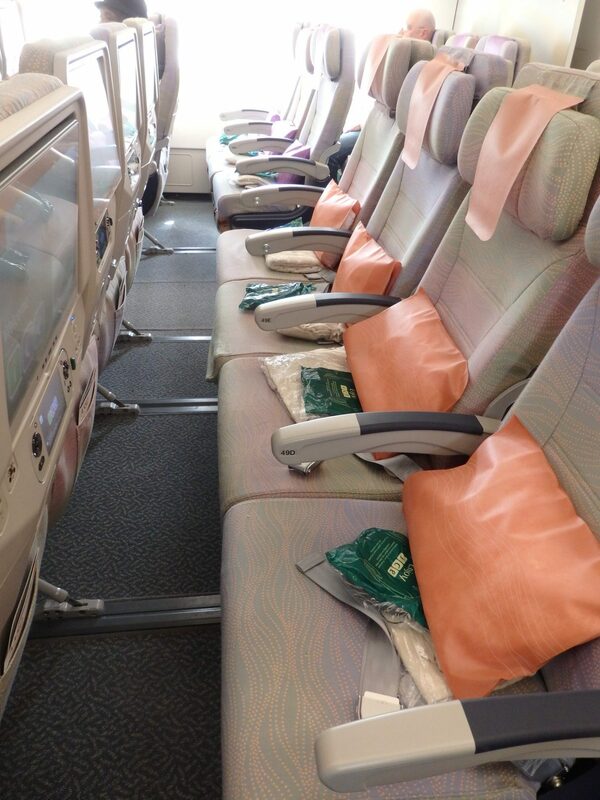 I flew business class a few years ago on a smaller, but huge, Emirates plane from LA to Dubai. It was paradise. Loved everything about it, most especially the food. Personally, I’m very reluctant to fly the A380. I consider you brave to have embraced it, considering you are generally fearful of flying. But I’ve heard from others who have flown it that it is a smooth ride. Wouldn’t business class be great on any plane? My fear comes out most with turbulence and sound changes, and this plane just seems to remove both. Or perhaps these two flights were just particularly smooth. Kudos to you for not letting your fear of flying stop you, Rachel! I can’t remember when I noticed that airline seats had gotten smaller. My knees hit the seat in front and I felt I was right under my neighbor’s armpit! When I did research for a post I wrote about it, I discovered that the airlines have indeed been making the seats smaller. I’ve never really paid attention to plane types but I will now. I’d be interested to hear more about your research. Just a difference of an inch can make a huge difference. I’m not that tall (about 5’7″ or 171 cm. ), yet my knees sometimes hit the seat in front of me! I’ve yet to fly and A380 but I’d love to do it. Fortunately, I have no fear of flying, so the noises don’t seem to bother me. But a smoother ride would be nice. And flying is one of the very few times I feel lucky to be SHORT. On almost any plane, I can cross my legs, or even tuck one leg up under me or sit in a lotus!! LOL. But the hot towels and metal flatware sound very nice! It’s the time when I feel envious: of short people and of people who have the kind of money (or job) that lets them fly business class! And of people who can fall asleep before we even take off and sleep through the whole flight! I’ve never flown Emirates but I’ve heard good things about them. I’ve always been to the Middle East on Etihad, who are excellent. From your account I think Emirates must be similar to Etihad. Yes, I’ve heard good things about Etihad too. Interesting post as well as info in the comments about the A380. I’m starting to wonder if jetlag is at related to the type of airplane a person flies. For example I recently flew Rome-Toronto the identical time or day etc as I have in the past and had no jetlag at all. Other times it suffered for days. Perhaps air quality and lighting plays a longer role than just during the flight. I’m sure air quality makes a difference, and the newer planes circulate and filter the air more. And I know the A380 has lighting that changes gradually in a way that’s supposed to help passengers minimize jetlag. We flew with Emirates based on their advertising and promise of wider seats, more legroom, better food and overall better experience and paid almost double price than other companies were charging, just to be more comfortable on a 6 hours flight from Prague to Dubai. Outbound flight was with their partner company Fly Dubai. Regular narrow seats and no complimentary drinks and food as they advertise. Not even complimentary water on a 6 hours flight ! Inbound flight was Airbus 380, a little wider seats and a little more legroom but nothing that would be worthy double price. Complimentary food just OK.
Wow, that’s really disappointing given how impressed I was with their service and space. No complimentary drinks even? They really should let you know if it’s going to be operated by a different airline! And especially if they’re offering such a reduced service! The prices can vary a lot. When I flew with them (always Amsterdam to Dubai and back), it was only a bit more expensive than other options and the times were much better for me than other options. And that little bit more legroom makes all the difference for me! I flew just recently on British Airways to Beirut and noticed how much smaller and lower resolution the screen was than on those Emirates flights.